Welcome to another Window Wednesday! Today I’m going to share with you a master bedroom project that I completed a couple of years ago for a client. You can check out the fabrics that we used in this video about how to mix fabric patterns. Be sure to check out our Decorating With Window Treatments page for more ideas, tips and techniques for your windows! 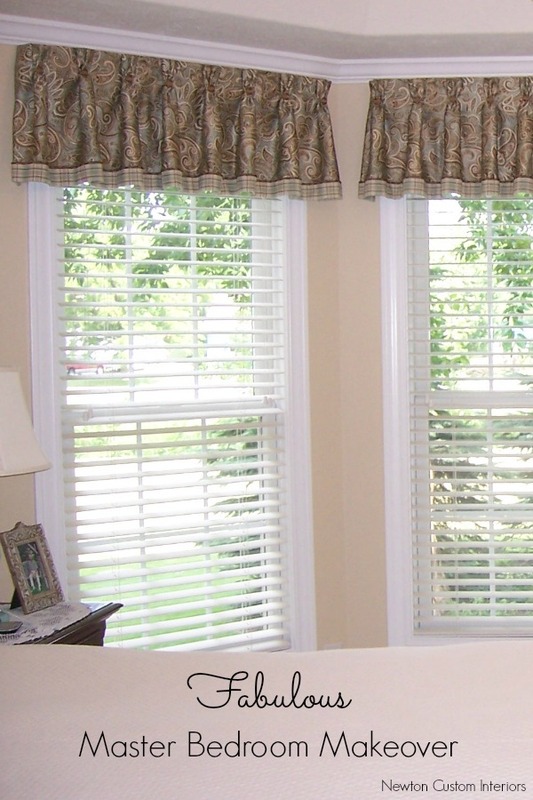 My client has a nice sized master bedroom with a beautiful set of bay windows. She wanted to update the room with new window treatments, bedding and paint color. Here’s a before picture of the bedroom. 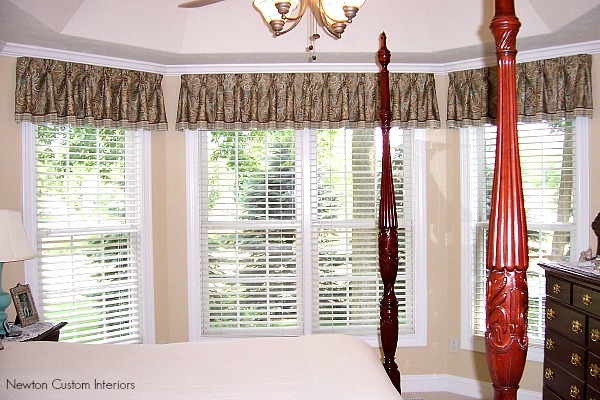 The valances were very nicely done, but my client wanted to change the color scheme. She was tired of the pink walls. 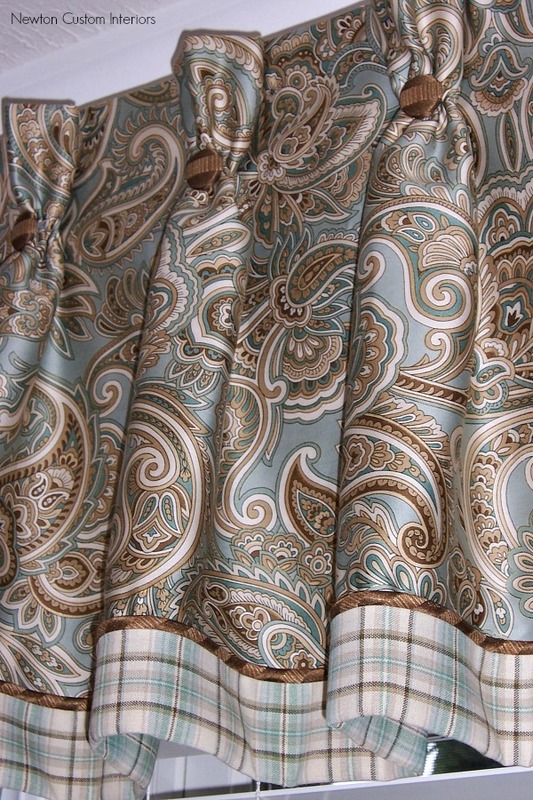 We chose a paisley fabric in blues, greens and browns. The banding is a complementary plaid, with a brown textured stripe cording along the top edge of the banding. The valances are pleated, and a button accents the bottom of each pleat. Stay tuned for the reveal of the bedding, and the master bath windows. Would you like some help with your windows? If so, just send me a picture of your window. I will feature one reader’s window each month by giving some suggestions for window treatment styles and fabrics with my computer rendering program. Pictures that are taken straight on to the window, and that don’t have any type of window treatment on them already will work best. I’m linking to my favorite parties here! « It’s Not Easy Being Green! They’re beautiful! I love piping between fabric contrasts. The shimmer and shine of the fabric is very pretty! Thanks Kim! Cording or piping is one of my favorite details to add to valances or pillows. I love the change to classy from pretty! The valances are beautiful with great embellishments! Thanks Joanie! Embellishments are my favorite! i have a friend who has been searching for a fabris like this. The colors would be perfect for her room. Would you be able to tell me the mfg. and pattern name? Peggy, these were made a few years ago, so I don’t know if the fabrics are still available. I believe they came from Greenhouse and Mitchell Fabrics which are both wholesale fabric suppliers. I just found this post through pinterest and was wondering if there was a pattern or tutorial you used for the valances? I would love to try and make these for my mother. Adrianne, I don’t have a tutorial for this valance style, but it’s on my to-do list! Would you share the designer fabric name of the cream/brown/blue fabric I love the fabric and would love to make some pillows. Thanks your window treatments are beautiful. Thanks Martha. I’m sorry, but I don’t know the name of this fabric. 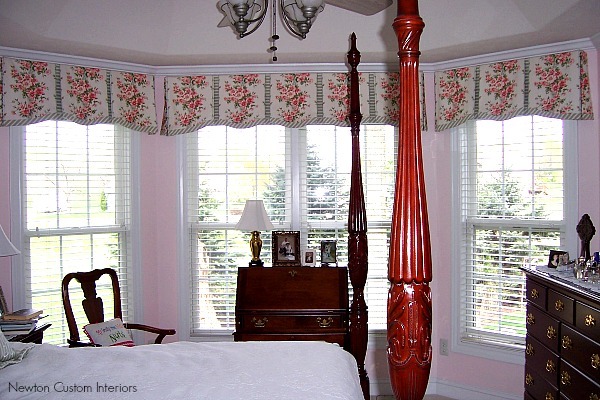 I made these valances 4 or 5 years ago for a client. Jann, I was so excited to see this article today! I am in the process of changing out my photography studio to a bedroom. I wasn’t sure what to do with my big window but now I know! Thank you so much. I love the fabrics you used, too. Love your beautiful work! Wish you lived close to me! Thanks Kathy! You just made my day! Good luck with your project.